Hey there! Hope y'all are having a lovely day! :) Today for ya I kind of have 2 reviews in one! This post is going to cover both I'm in the Moon For Love and Infrared-y To Glow. 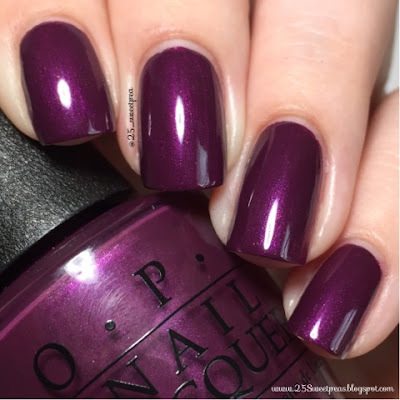 I will have to say OPI is really great about playing with words! It's fun! First up is I'm in the Moon for Love. I am loving this color! 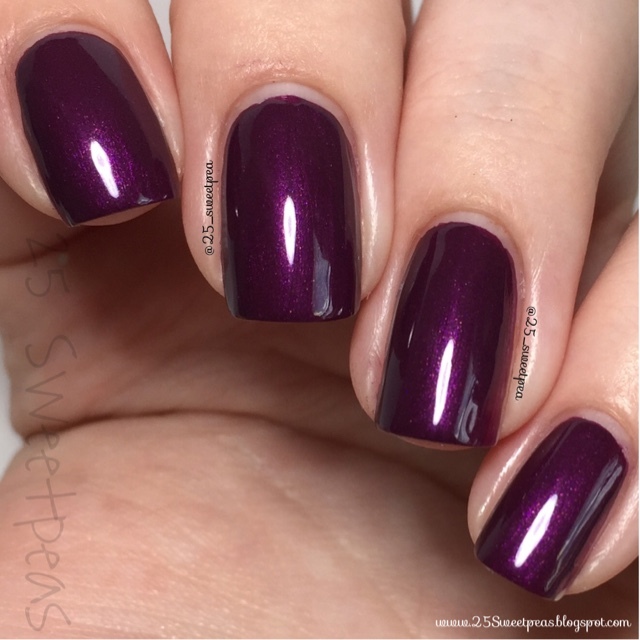 It's a gorgeous deep eggplant color with a nice shimmer and over all it's just really pretty. It's perfect for fall. It was a 2 coater which is pretty good in my opinion. Plus even though it is a dark color I had no staining issues what so ever so that is wonderful! So next up I added Infrared-y to Glow on top. I did a little bit of placement, sponging and I tried to do a glitter gradation so let's look at it. First let me start by saying I was pretty excited about this glitter, because in the bottle it looked like it had little chevron shapes in it. I had never seen this shape in a glitter topper so that was pretty neat. However on I was not as impressed. Th ratio of clear to glitter was terrible. Way way too much clear you would have to do a ton of coats to guarantee you would even get any glitter on your nails. Which is a lot of work and you know that means a long drying time if you just keep on layering. So that was a bummer. So that is why I sponged it on one nail. That does work but really the chevron shaped glitters didn't lay on the nail wonderfully and even with a top coat they snagged on things. So I don't honestly think I would use this polish that often. 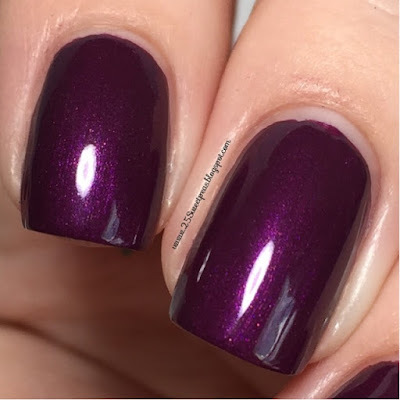 I can see it being used as a polish you pour out and use for a placement, but the glitters in it are really hard to pick up. I guess it would all be in how much patience you have that day! :) I do have a tutorial for this look so check that out below! Overall I really like I'm in the Moon for Love, but I'm not a fan of Infrared-y to Glow. What do you all think? 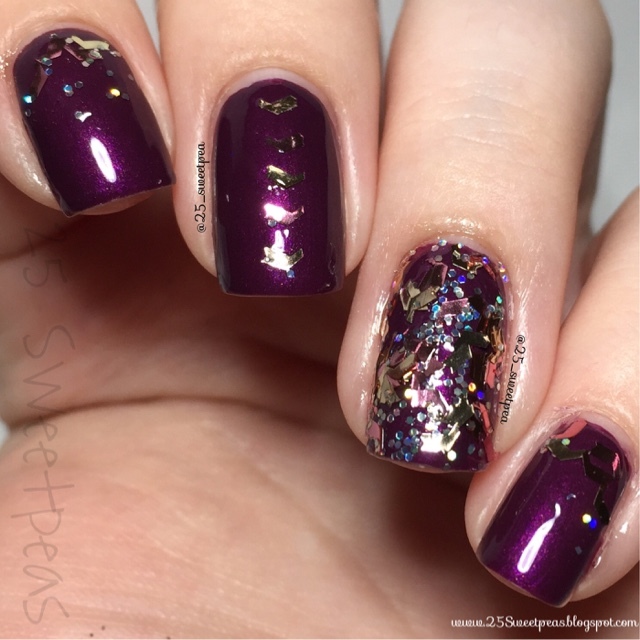 The glitter was pretty but to me the formula was a miss. Well I hope you all enjoyed this post! Let me know what y'all think below!